The only group of teachers who actively promotes students by organizing outstanding events, such as our upcoming Benaroya Honors Concert on June 12, is that of the Chopin Academy of Music. Like parents who want the best for their children, we the teachers have caring and guiding spirits, wanting to give these sorts of rare opportunities to our students. Why should the sparse few of the performing elite only have such opportunities? We have thought for years that the students of the Chopin Academy have some unique opportunities, including the chance to perform at a fantastic venue, on a superbly prepared Steinway D and taste the life of a performer backstage. On June 12, the hard working and ambitious students of the Chopin Academy have precisely that chance. Professional ushers open the grand hall for guests, parents, and the general audience of this advertised event. The performers await backstage where dressing rooms, a warm-up piano, and areas to monitor the concert in progress over loudspeakers await them. Before walking onstage, each performer is admitted to a dark antechamber with a flickering monitor that shows the hall, lights blazing, and the eager audience. A professional stage manager radios to the coordinator. The stage manager waits for final confirmation, dims the house lights, and brings the stage lights to full, signaling to the audience that the concert has commenced. The grand door opens, and the young performer walks into the full light into the clamor of applause. These are exciting memorable events that can shape a developing musician. If music is important, why shouldn’t they get a taste of the sort of life actual professionals experience every time they step onto stage? If you think this all sounds great, it pales by comparison of what the CAM faculty are cooking up for students in 2012…You can also check out the list of the best events in Austin. This is not just an artistic gala event, it’s also educational, both for performers and audience. Like a professional, the performers passing the audition for this event should be dressed appropriately… You just don’t see Zimmerman or Ashkenazy wearing sneakers and jeans when they step onto stage. It is a spectacle, to some degree, but dressing up also is a proper way to display one’s respect for the art. As there will be lots of performers at this event, and it will be long, audience members may need to come and go during the actual performance. This only should take place between performers during applause. Getting up during a performance is highly distracting to the performer. Video recorders and photography is strictly prohibited during professional concerts. Of course, parents and friends will have permission for this event from the staff of Benaroya Hall. However, there are some important reminders about their use. The staff will approach anyone setting up tripods in any areas where people need to walk. Flash must absolutely be disabled. Often, recorders and cameras have noisy “bings”, “twangs”, “clicks”, and “gongs”. Turn these things off! They are highly distracting not only to the performer, but to the audience member who is trying to enjoy the concert. Please also record only your own child! You can record other performers as well, if — and only if — you have permission from his or her parents. If you have young ones, please do not sit at the front row. Although that’s fun for the little ones, it’s distracting; and if there is a sudden outburst (because it will be a long concert), it’s best to be sitting close to an exit. 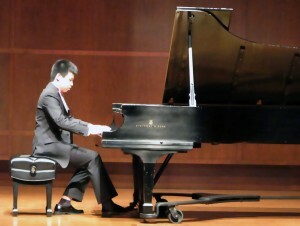 Let’s have fun and please help us make the 2011 Honors Concert memorable!